"Some receive daily the Body and Blood of the Lord, others receive it on certain days; in some places no day is omitted in the offering of the Holy Sacrifice, in others it is offered only on Saturday and Sunday, or even only on Sunday; and as to other such differences as may be noted, there is freedom in all these matters, and there is no better rule for the earnest and prudent Christian than to act as he sees the Church act wherever he is staying." You seem to miss the point. St. Augustine is talking about the frequency of the offering of the Divine Liturgy. He says in some places it is daily, in others only on weekends. But the assumption is that all Christians will Commune at the Divine Liturgy when it is offered. "Frequent, even daily communion, was customary in the churches of Africa, but not in the Eastern-Greek speaking churches." So should we make the customs of men the Commandments of God? Should the whole Church adopt Greek practices? The ancient tradition of the Orthodox Church is frequent Communion and nothing else. There is no room for "variety of practice" in this. A Christian should Commune frequently. Period. But I now understand that there are different traditions. No disrespect intended, Father, but then did he have Typikon services outside the Fasting periods?. Liturgy was served every day in the monastery, The officiating priest communed. Likewise in the bishop's church in the nearby city of Kraljevo, Liturgy was served every day. Most usually only the officiating priest communed. Ditto for those parishes which have a daily Liturgy. I was altarbor for Bishop (Patriarch) Pavle in the cathedral at Prizren for two weeks during the Great Fast. Presanctified was served every weekday by His Holiness himself. It was attended by all 40 of the seminary students every morning. Nobody communed. Only Bishop Pavle and any priests serving with him. If I recall my DL correctly, the priests commune before the priest comes out and exclaims "In faith and in love draw near." Who would they be speaking to, if only the officiating priest communed? Of whom is the priest speaking when he asks the congregation to pray for the catechumens when there are no catechumens? To whom is the priest speaking when he orders the catechumens to depart even though there is no catechumen in the church? He is addressing the catechumens. I don't understand your point. I don't know if superstition is the correct word. After all, it is a frightful thing to commune the Lord of All. We all believe, or should believe, that. The question is being Pharisees about it. That's a bit unrealistic. How can I say that the 90% of parishioners who are at Sunday Liturgy but do not commune are "not Orthodox." What would be the percentage of communicants in your Greek parish on any given Sunday? Do all of them go up for Communion? 50% of them? Until the World is converted, the Church had better have catechumen always. Our priests don't: it's been dropped from Antioch and Alexandrian (and for all I know, Constantinople/Greek) usage for the reason you are suggesting. Father is saying why say it if there are no catechumens. Let me further illustrate the problem: I've been told by a number of priests of how some people will come to confession, recite the preliminary prayers and then, when it comes to confess the specific offenses, say "I've nothing to confess." Some praise St. John of Kronestadt for contracting a "spritual marriage" with his wife, and treat her like a sister, according to their account. Did the priest who married them leave out the references to children ("spiritual marriages" don't beget any), references to wedding them into one flesh, etc.? (a gay Orthodox told me of a pseudo Orthodox priest who "adapted" the wedding rite for gays. According to him, he had to gut the whole thing with its references to children etc.). Atheists who baptize their children. In whose Faith are they baptized? The text of the Divine Liturgy presupposes communicants. It is a problem if there are none. What is the size of an average Sunday congregation at your Greek Church? What percentage of them go to Communion? How frequently would the parishioners of your parish receive Holy Communion? Actually, I think "superstition" is the correct word, at least in the case of Greek Churches. At our monastery, the Hegumen after Divine Liturgy one day called out to a "yia yia" who attended DL weekly but had not Communed since Pascha (it was now August). He asked if she had fasted, and she replied "yes". He asked if she had Confessed, and she said "yes". He asked if her Spiritual Father had told her to abstain from Communion as an epitemia, and she said "no", so he asked her why she didn't Commune, and she replied "Out of respect for the Holy Gifts". The Hegumen said that this was "superstitious nonsense which comes from demons" and then went back into the Sancturary and retrieved the Chalice and ordered her to come forward and Communed her. Superstition is a false belief often mistaken for piety. 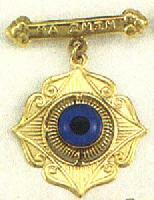 Examples are the glass "blue eye" bead worn by some Greeks around their necks with their Crosses to "ward off the evil eye". In some cases I have even seen Crosses with blue eyes in them. These superstitions are believed to be "traditions of the Church" by some misguided Greeks. I attend Liturgy at the Holy Monastery of St. George in the Blue Mountains. Our regular congregation (those who live locally) is around 70, and most of these Commune every Sunday (thanks to the insistence of our Hegumen). Some Commune on Saturday as well. I recall being told of a priest who, when no one came to commune, put the chalice down and proceded to upbraid the congregation, asking that if they had invited him to dinner and when he came he didn't eat what would they think. I know a priest who, on a weekday holiday where only the retirees were present (workday), he asked if anyone was going to commune. When they said no, he served a Typika service instead. OH HOW I HATE THAT. I remember severely upbraiding someone in Egypt for dressing their son as a girl (to ward off the evil eye, a common practice) in addition to him wearing a cross. They had no response to my question "the Cross of Christ isn't strong enough?" A Christian should Commune frequently. Period. Myself and my family certainly do--when properly prepared. But I do not want to pass judgement on someone who receives infrequently. No one is passing judgement on those who Commune infrequently. What is being discussed here is the teaching of the Church and whether infrequent Communion is orthopraxis or misguided. This is a ridiculous, ludicrous red herring aimed at both New Calendarists AND Catholics. I must say I'm impressed that one can manage to insult both in a completely baseless, overly generalized, and tangential post on a thread which has NOTHING to do with either the calendars or Catholics! It also disturbs me terribly to read on this thread a lot of harsh things aimed at converts (just one example of which was someone saying frequent communion was invented by the converts who think they know better than the cradles...). This is more baseless over generalizing with no evidence to back it up. This is not the "safe side", this is a dangerous practice. It's like anorexia. You are starving yourself of the Bread of Life. May I sincerely and respectfully ask what you make of the canon (I can't cite the exact one right now, as I have not loaded the Church Fathers onto my new computer yet and thus don't have it at hand... maybe someone could help me here) that states that anyone who abstains from communion more than three times in a row is excommunicated? And, for clarity, I believe that the canon is not speaking in terms of weeks (three weeks in a row), but rather when communion is offered (in other words, if it is offered daily, they are excommunicated after not receiving three DAYS in a row). What is your stance on that, since it is a formal declaration accepted by the Church universally? Someone mentioned this earlier, but I don't recall a response to it. I would also be interested to read your interpretation of the point that ozgeorge made about the Presanctified Liturgy (my husband's specialty is Liturgics and teliturgics, I find both quite interesting). It is specifically to be celebrated during the week, and is the MOST ancient Liturgy in existence, thus attesting to the fact that more than 1600 years ago, the tradition of the Church was frequent, daily communion. What would be your response to that? Again, I ask sincerely and respectfully, not with anger or judgment. May our Lord remember your Holy Priesthood in His kingdom! (just one example of which was someone saying frequent communion was invented by the converts who think they know better than the cradles...). This is more baseless over generalizing with no evidence to back it up. This was the way it worked out in the UK among the Russians. Metropolitan Anthony Bloom said that it was the example of the English converts who wanted more frequent Communion which, over trhe years, moved the Russians themselves to more frequent Communion. I REALLY like this!!!! My Sunday Schoolers have a problem wherein they don't go to Liturgy but come to Sunday School instead. I frequently stress the importance of receiving the Eucharist in an effort to overcome this issue (and it is, by God's grace, slowly changing, as they are beginning to attend Liturgy more often). May I have your permission to repeat this to them during our lessons? I think it speaks to them in terms they can understand. the canon.... that states that anyone who abstains from communion more than three times in a row is excommunicated? I appreciate the example of one specific case. However, I would counter by saying that this does not explain the stress put upon frequent communion by the saints (as has been frequently mentioned in this thread). Nor does it explain the rest of the Orthodox world (such as the US, for instance). This is why I say it is generalization and baseless. I would say, IMHO, that the one specific case does not prove that "converts" are single-handedly responsible for the stress on frequent communion in the ENTIRE rest of the world. I enjoyed your monastery story. But when we begin accusatory implications about "superstition" we are getting close to the line which must not be crossed. We are not heart readers. Would "heresy" be a better word? Because that is what the teaching of a "pious" abstinence from Communion is. When I visited Athos in 2005, it seemed that the practice of monks communing every Tuesday, Thursday, Saturday and Sunday outside of the fasts (i.e after every fast day in addition to Sunday). During Lent they communed everyday. This practice has its roots in St. Nikodemos. He and St. Makarios of Korinthos wrote extensively on the topic of reviving the practice of frequent communion for the laity. I'd also be wary of invoking an argument from inertia (it was this way for 1600 years, ergo the practice ought to continue). Afterall, it's been a good thousand years since any real missionary efforts have been launched save a few priests running around the fringes of the Russian empire. Therefore, should one conclude that it is in any way acceptable to not engage in missionary work? I have the book titled, "Concerning Frequent Communion", by St Nikodemos the Hagiorite. It is a wonderful read and makes a very good case for frequent communion. Would "heresy" be a better word? Are you sure it is a heresy? The canon is observed in the breach, else we would have millions of excommunicated Orthodox all around the world. One thing about the canons (which many folks don't realise) is that they are not firecrackers or landmines which will explode in your face when you step on one. The canon needs to be "activated" or "applied" by the competent church authority before it comes into force. To my knowledge, no church authorities in any Orthodox Church apply that canon today. It is probably a question which your husband has more knowledge of than I do. My "folk" understanding is that the Presanctified comes to us from Pope Saint Gregory the Great of Rome, the Dialogist. His life spans the 6th century so I have assumed (not that I have actually thought about this particular point very much) that the Presanctified is a work of that century. Of course, if the attribution to Saint Gregory is mistaken or if he simply put the "finishing touches" on an older existing Presanctified....? It would be interesting to hear what your husband thinks. Those words are like pure oil poured into my wounds. Thank you, very sincerely. I am feeling as if I have been pilloried and scourged on the Forum -like an "Old Believer" in Tsarist Russia. And may He remember that of your husband and especially your own service of sacrifice for the holy Church as a presbytera. Well, as has been demonstarated, the practice of the Ancient Church was frequent Communion, the Fathers of Athos encourage frequent Communion, St. Symeon the Theologian encouraged the revival of this ancient practice. To pray for our "daily bread" and then refuse to eat it when the Bread of Life makes Himself available for us is not only heresy, it's blasphemy. [No one is passing judgement on those who Commune infrequently. What is being discussed here is the teaching of the Church and whether infrequent Communion is orthopraxis or misguided. .... when we begin accusatory implications about "superstition" we are getting close to the line which must not be crossed. So you are saying that someone who communes infrequently for reasons of either piety or laxity---is a blasphemous heretic? If something is the opposite of the ancient teaching of the Church is it Orthodox teaching or cacodox teaching? Teaching infrequent Communion is a cacodox teaching leading to cacopraxis, therefore it is heresy. No. I am saying that someone who teaches people to "piously" abstain from Communion if they are prepared for it is teaching heresy and misguiding people. Those who practice this heresy are practicing superstition and cacopraxis- whether they realise it or not. If anyone can produce anything from the Orthodox Fathers which teaches that the Faithful who are prepared for Communion should refrain from it out of piety, I will gladly withdraw my claim that this teaching is heresy. Thank you for your kind reply, Father. I realize that the canon is not enforced, to do so would be nearly impossible, and not in the best interests of the faithful (IMHO). My point, actually, in bringing it up was not the canon itself, but the fact that it is an indicator that the intent of the Church, and the tradition, is that of frequent communion. Had the fathers not intended for us to receive frequently, they would not have made this canon. Would you agree? I would personally say (and again, this is just my opinion), that, considering all the evidence (patristic, canonical, etc) points to the Church encouraging frequent communion, that the practice of infrequent communion is, indeed, an innovation, even if it is as old as 1600 years ago. Again, though, this is just my opinion, and I don't say it with scourn or judgment. It is not my business how frequently an individual believer receives. That is between him (or her) and their spiritual father. Speaking in the theoretical, and from my limited knowledge and experience, this is my opinion, respectfully. You are correct that it was Pope St. Gregory the Diologist, of the 6th century. However, it is believed that he penned what was already the practice in Constantinople (put the finishing touches, as you said). This makes the Presanctified Liturgy and the practice of daily communion at least as old, if not older than the 1600 years which you have provided as the time span where infrequent communion is the practice. Even if it does NOT predate the 1600 year tradition which you have alleged (and I don't mean that with negative connotation, I just can't think of a better word. Sorry! ), I would say (IMHO) that either way, the Presanctified Liturgy was a formal, public, and extremely important institution of frequent communion. In other words, the Church very publicly and formally instituted frequent communion and expected everyone to partake. Do you agree or disagree? I keep trying to get my husband to join the forum. He just doesn't have time, unfortunately (we have over 1000 families and only two priests in our parish). I will ask him for more details about the Presanctified Liturgy, though. I'm sorry that you feel that way, Father! I think it is admirable that we all are so passionate about our faith and adhering to the correct application of that faith. But it is, indeed, sad and unfortunate that we sometimes expressed in a way that makes others feel badly. Glory to God! Thank you for your prayers. Please continue to pray for us. And if I might ask, on a personal note, Father, for you to pray for my Papou (his name is Angelo), who fell asleep in the Lord last night. I would be very grateful. This practice of communion 4x a year or less is the more recent development, and I consider it to be a departure from early tradition, due to the factors I alluded to in my earlier post. People should take weekly communion, but only if they are repenting of and confessing their sins. The Orthodox should strive to maintain the balance between reverential fear of the cup, as well as the necessary life giving properties of the cup. This has been addressed many times if you read the thread. No one is advocating taking Communion unprepared. Yes ,no one is advocating taking Communion unprepared. So what is this thread for? Someone thinks ebdomo-xerophagy is too much ,then opened this thread to argue,isn't it? My question is:if they think 7days is too much,so how about 3days(which is the tradition of kolyvades). If 3days also too much...then what? 2days？ 1day? nothing? The question is what, exactly, preparation (and therefore the "established rule") entails. It seems obvious to me that, ultimately, it is one's spiritual father who sets an individual's rule. Period. I see you are from Antioch, dear Sakran. Do you know what your people were doing in the 20th century with their preparation for Holy Communion? What about in the 19th century? the 18th centiry, the 17th century? Were they communing weekly? Daily? The 16th, 15th, 14th, 13th, 12th, 11th, 10th, 9th, 8th......centuries? St Nicodemos deals skillfully with every possible objection to frequent communion in his book. Not all ancient customs are traditions. Some are just old problems that won't go away. As much as I dislike Fr Alexander Schmemman's theology, he never suggested nor would have supported doing liturgies in street clothes, or anything that extreme, at least what I can tell from his writings. I personally would agree that many people go to communion unprepared too often in America, but at the same time, if people are prepared, they should go as often as they are prepared. Those who would attack any kind of fasting before communion, however, would as Fr Ambrose points out, be ignoring basically the entire Orthodox world's practices for the last few centuries. If we understand fasting before communion as a pastoral tool though, it should not be too controversial.